* Start, pause, stop screen recording with user-defined hotkeys. 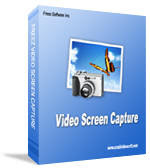 * Record screen activities into Standard or Compressed AVI video files. * Record any region of the screen. * Record Screen in any screen color depth. * Supports sound recording from microphone, videotape, Internet, etc. * Select the video encoder for your screen recording output AVI file. * Adjustable screen capture framerate, output AVI video quality. * Set the sound recording format and compressed audio format. * Can record Actual Cursor on the screen. * User-friendly interface, easy to use. * Free to use and register.